The Elite Vantage greenhouse with its size of 7ft 5" wide it will give you the maximum size for your space allowing you a superb growing environment. This greenhouse comes complete with the new wheelbarrow and wheelchair friendly 'low threshold' integral built in base where there is no step to trip over, as with many other makes, integral gutters and at least 1 roof vent, more with larger sizes, and all this as STANDARD. The Vantage is available in 3 glazing options horticultural glass, toughened glass and polycarbonate with sizes from 4ft 5" x 7ft 5" to 20ft 5" x 7ft 5" in a choice of 8 colours, Green, Brown, Black, White, Terracotta, Graphite, Berry, Olive and Stone. Greenhouse Accessories can be add such as crestings and finials, bar capping and extra roof vents, staging, shelving, auto vent openers etc. If you require a size not listed on the website please give us a ring on 01945 410 361. Please Note: These Elite Garden Centre Exclusive Greenhouses can only be ordered over the phone and are only available within a 30 mile radius of Wisbech in Cambridgeshire. 4ft 5" x 6ft 3"
Available in 3mm thick overlapping glass sheets. In the event of a breakage, the glass granulates removing any danger of injury. We ONLY supply the genuine Elite Grade A toughened glass to Standard EN12150 in full length sheets providing a neater finish, especially with bar capping, and removes any overlapping glass where algae and moss can often be a problem. UVI treated 6mm thick, twin wall with silvered edges and, like the toughened safety glass, it comes in full sheets and is as great option where children and pets are concerned. If you would like to have your greenhouse erected for you, then we can suggest an erection assembly service. 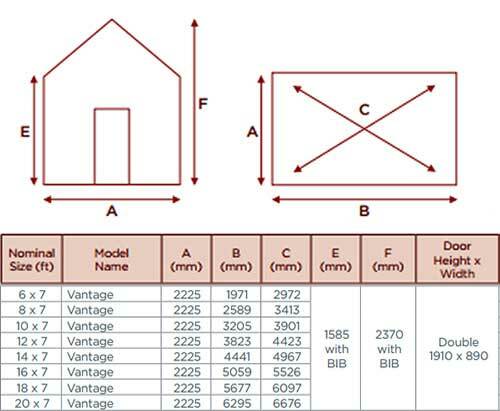 Prices would include full erection of the greenhouse, either using the ground anchors provided with the greenhouse or fastening it onto a concrete or slab base. There would be an additional charge for any greenhouse accessories purchased with the greenhouse such as staging, shelves etc. The service is only available for greenhouses purchased from us, if you are interested in this service please contact us on 01495 410 361. FREE delivery on all Elite greenhouses to the UK mainland except parts of Scotland, if you live in Scotland please phone the office 01945 410 361 before ordering. 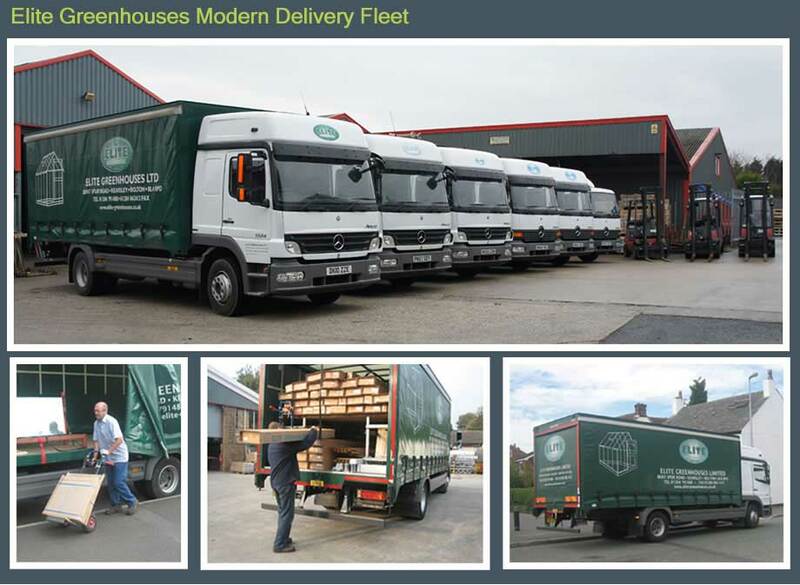 Elite deliver the majority of greenhouses direct to your door, nationwide, using their own fleet of vehicles. Customers based in Ireland, parts of Scotland and other off shore locations can arrange their delivery through local shipping agents. Their vehicles are Class II 15 ton lorries,similar in dimensions to a furniture removal van, so if you have access restrictions to your property then please contact Barretts on 01945 410 361 to discuss an alternative address and to clarify your postcode for the delivery route. Elite lead times are only for guidance so please check with Barretts as they can vary throughout the year. Please inform Barretts Leisure if you are unable to take delivery at any time. If you know your address is difficult to find, or there is something unusual about your address (like the postcode doesn’t bring you anywhere near your house) let us know at the time of ordering. The delivery period for the smaller Elite greenhouse accessories in natural alloy finish that can be posted is usually 4/5 days, for the larger items that have to be delivered by Elites lorry please allow 4/5 weeks. For natural aluminium finished greenhouses please allow 4/5 weeks and 8/10 weeks for coloured greenhouses and coloured accessories. Elite will contact you approx. one week prior to delivery to say which day delivery will be, if you are unable to take delivery on that day or to arrange for someone else to attend, please let us know by the Thursday prior to delivery and we will arrange for it to be delivered on the next available lorry. If you wish to make sure about the delivery time or request for the driver to phone you approx. 1 hour before delivery please phone the office on 01945 410 361. All accessories purchased on the same page and at the same time as the greenhouse will be delivered free of any carriage charge direct from Elite with your greenhouse. Accessories purchased separate from a main greenhouse order from our accessories dept. will be delivered direct by the wholesaler or manufacturer concerned and will have the delivery charge built into the price. The larger accessory items are delivered by Elite's own transport which usually revisits an area every 4/5 weeks. As mentioned above Elite usually work on a delivery period of approx. 4/5 weeks for most natural aluminium greenhouses apart from powder coated, when you should allow approx. 6/8 weeks, unless Elite have any from stock available, please ring to check (01945 410 361).